"Love" token, awarded by Zoot. "Love" token, awarded by wo262. When using the Shader Editor, you can use it instead of the Material Properties, except for the fact that there is no way to switch the active material slot. I want to take this on! 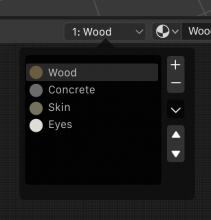 When you change the material in the material data block selector, are you changing the material in the selected slot? Also, I think it might make sense to move the "Use Nodes" elsewhere to make room for this? I don't see that used very much, and it takes up the space that the slot does in the mockup. It could be moved to the settings panel in the shader editor sidebar. @Hans Goudey (HooglyBoogly) it would work exactly like changing the active material slot inside Material Properties. And yes, Use Nodes is something we should remove, but it’s unrelated to this task, so leave it for now. I chose to just display "Slot #" to avoid some confusion and redundancy. Material slots vs. materials themselves can be confusing for new users, so I think separating them a bit by not displaying the name twice is valuable.